Photos From The Root 100 2014 Gala: Turn Down for What?! This year's cohort of honorees basked in one another's company at The Root's annual gala, held Thursday night at Espace in New York City, honoring the most impactful African Americans between the ages of 25 and 45. The Root 100 honorees Tamron Hall and Van Jones, The Root Editor-in-Chief Henry Louis Gates Jr., and host Sunny Hostin. Event sponsor Infiniti displays its latest model vehicle in the reception hall. An elegant arrangement fit for The Root 100 honorees. Omar Wasow, Natalia Allen, Henry Louis Gates Jr. and Althea Wasow. The Root Managing Editor Lyne Pitts and Editor-in-Chief Henry Louis Gates Jr. The Root 100 honoree Jamilah Lemieux. The Root 100 honoree and The Root contributing editor Peniel Joseph. The Root 100 honoree Janet Mock. The Root Publisher Donna Byrd and Editor-in-Chief Henry Louis Gates Jr.
Co-hosts Van Jones and Sunny Hostin deliver remarks. Co-hosts Van Jones and Sunny Hostin. The Root 100 honoree Mark Luckie, Amtrak Senior Director of National Advertising and Marketing Programs Darlene Abubakar, and The Root Sales Manager Michelle Okeke. The Root 100 honoree Mychal Denzel Smith and guests. The Root 100 honorees David Johns and Rashad Robinson. Honorees and guests chat during dinner. Guests enjoying themselves in the photo booth, sponsored by Acela. The Root 100 honoree Mitzi Miller and guest. The Root 100 honorees Georgia state Rep. Stacey Abrams, Rashad Robinson, Janet Mock and Van Jones speak during a panel discussion. The Root 100 honorees pose for a group photo. 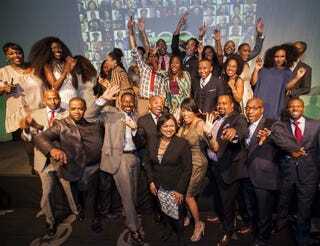 The Root 100 honorees with Amtrak's Darlene Abubakar (front row, center). Henry Louis Gates Jr., The Root 100 honoree Tamron Hall and Lyne Pitts. The Root 100 honorees Mitzi Miller and Jamilah Lemieux speak with honoree Claudia L. Gordon via Gordon's interpreter. The Root 100 honorees Orlando Watson and Zerlina Maxwell. The Root Social Media Editor Terron Moore and guests in the photo booth. The Root Managing Editor Lyne Pitts and Associate Editor David Swerdlick deliver remarks. The Root 100 honoree Feminista Jones and guest. The Root 100 honoree Feminista Jones and The Root contributor Demetria Lucas. The Root 100 honorees Bozoma Saint John and Jamilah Lemieux. The Root staffers Michelle Okeke, Diana Ozemebhoya Eromosele and Nicole Cvetnic. The Root 100 honoree Rodney Priestley. Henry Louis Gates Jr. with co-host and The Root 100 honoree Van Jones. The Root 100 honoree Joshua DuBois and guest. The Root 100 honoree Stacey Abrams. Henry Louis Gates Jr. and The Root 100 honoree Luvvie Ajayi. The Root 100 honorees Claudia L. Gordon and Yoruba Richen. David Swerdlick, MSNBC's Alexis Stodghill and Omar Wasow. Angela Rye, Demetria Lucas and guest. The Root 100 honoree Orlando Watson and The Root Publisher Donna Byrd. The Root 100 honorees and guests toasted their accomplishments with J.P. Chenet Ice Edition Sparkling Wine.